You’ve got to get up on the board and the technique is very similar to what we are used with our twintips but here is where you will first realise that a little weight in the wrong place can have alarming results! Change your technique in a few fundamental ways and we’ll have you up and on the board ready for your first runs. 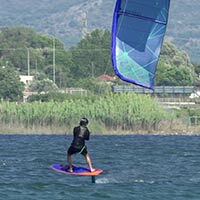 Waterstarts are something all kiteboarders are all well accustomed too but when you are new to foiling, it can be a shock that something we take for granted can once again cause us a such a headache. But it doesn’t have to be if you understand a few simple techniques that will make everything far easier. You need to focus on one thing - keeping the board on the water through out, with the whole foil under the water. Here you will still experience the lift from the foil but it’s your task to ensure you keep it under control and under the water. Even once you’ve learnt the skills needed to ride up on the foil, you’ll still waterstart, get your weight balance before popping up. Waterstarting straight onto the foil is possible but don’t waste time on it early on when there are more important skills to master. In this video will be focusing on the fundamental techniques when you ride with straps - this definitely makes it easier to keep the board in position and gives you more time to think about the various stages. Please confirm that you'd like Progression to email you when the new Waterstarts is available to purchase? You currently have an notification setup for the new Waterstarts and Progression will send you an email to let you know when it is available to purchase.